Tagged with Erasmus, EU, Europe, Funding, Student mobility. The new Erasmus+ programme has paid out €918m in grants for studying, training or volunteering abroad in 2014, the European Commission has said, funding work and study abroad for more than 500,000 students and 150,000 staff across Europe. A new report on the first year of the programme emphasises a renewed focus on widening access to study abroad, including more funds for students from disadvantaged backgrounds. The first annual report for the Erasmus+ programme, the new EU programme for education, training, youth and sport that consolidated seven previous programmes including Erasmus in 2014, showed that €1.19bn or 66% of the total €2bn budget for the first year was spent on mobility initiatives. These mobility initiatives include the creation of 11 new Erasmus Mundus Joint Master Degrees, with funding going towards 440 additional master’s scholarships over the next five years, as well as the 138 master’s degrees and 42 joint doctorates the programme already supports. The majority of mobile students and staff came from six countries. As in previous iterations of the Erasmus programme, the largest numbers of participants came from Germany (11.6%), France (10 %), Spain (9.3%), and Poland, Italy, and Turkey followed. The largest portion of funding for mobility went to 341,393 students and staff in higher education, who collectively received some €600.8m to study or work overseas. The VET sector followed, with 126,004 grants being awarded for student and staff mobility, totalling €264.1m altogether. A further €125.7m supported youth mobility programmes, with grants also going to support school and adult education staff mobility, Erasmus Mundus degrees and large-scale volunteering events. In their first year, higher education awards included more than 10,000 ‘top-up’ grants (totalling nearly €6m) for students from disadvantaged backgrounds in countries where extra support is not provided through national funding or other sources. The report notes that in 2014, mobility funding “extended to other action fields, beyond youth, the additional financial support to people with fewer opportunities, from a disadvantaged background or from remote areas in order to make the mobility programme more accessible and inclusive”. 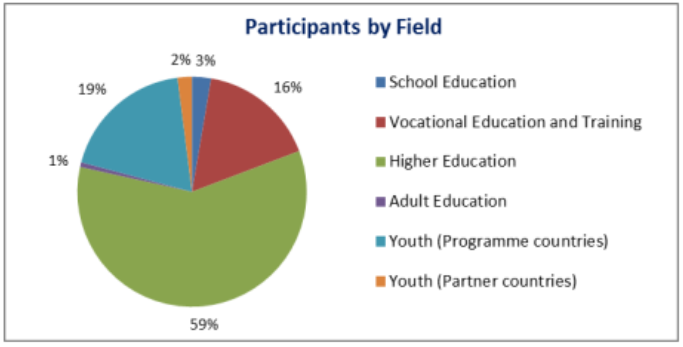 Extra funding was also provided for the more than 2,000 mobile students who came from the outermost participating countries and regions, including Martinique, Guadeloupe and Madeira. “Geographically very distant from the European continent, their remoteness is compensated with higher grants to ensure that they are not excluded from mobility actions,” the report explains. A further 800 students and staff with special needs received Erasmus+ higher education grants, including 240 who received additional financial support enabling them to participate. As part of its annual report, Erasmus+ gathered feedback from the National Agencies responsible for managing funding in each country. “NA’s feedback confirms that the EU policies and Erasmus+ programme address issues with political and economic relevance and are very close to the concerns of citizens,” the report notes. “The rising trend in demand for programme support demonstrates its high potential which, combined with the political commitment to invest in Education, Training and Youth policies could arguably make the case for the deployment of more funds in the future,” it adds.